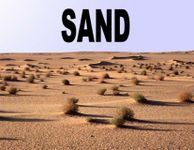 Sand is the title of a role-playing game that I designed in the nine days between 20 May 2005 and 29 May 2005. It was one of many role-playing games designed by many imaginative designers as a part of an annual Game Chef competition, to make a complete game within a set timescale and with several or more restrictions and specific requirements. The current Invincible, the twelfth ship of the Royal Navy to bear the name (and the second space cruiser) was built at Marquee in the Landis sector of the Empire in 2954, and was launched by Her Majesty, Queen Elizabeth IV in the same year. She served with distinction in the Falthroy Campaign of 2967 and the Hextor Campaign of 2971. Wine - The rare, valuable and highly addictive nectar-like juice produced by the Pandoxa plant and extracted and sold by the colonists on Sand. Wine is very potent and taken in it raw state will kill a person instantly. Only a very tiny amount produces the narcotic effects that its addicts crave. It is taken in many different forms. It tastes absolutely delicious though and therefore is most often served as a beverage, like the drink after which it got its name. Entomology - the indigenous hive-like race of ‘bugs’ called the Xixuthrus, who live on Wine and protect the Pandoxa fields with a fervour bordering on insanity. Xixuthrus are huge, vaguely termite-looking and extremely dangerous bugs that build their nests close to fields of Pandoxa plants for the workers to collect the Wine that is produced in the plants. The Soldiers actively guard their fields against intrusion by Scouts from other colonies. They are terrifying fighters, especially when high on Wine and will defend their territory to the death. Although nobody has seen one, it is believed by the few entomologists that have visited Sand to study them, that in the nests there is a Queen, pretty much like ants, termites and bees of Earth.